Apple Digest: Apple: 3 More Up Days, 3 More All-Time Highs! AAPL - another all-time closing high of 240.60 on Wednesday, April 7. AAPL has set 3 all-time closing highs this week. AAPL is up +1.96% for the week, up +2.38% for the month, up +14.17% for the year, and up +189.50% since the March 9, 2009 market bottom. This equates to +$4.63 for the week, $5.60 for the month, +$29.87 for the year, and +$157.49 since the March 9, 2009 market bottom! Apple's market capitalization at $210B+ is now third largest in USA, behind Exxon and Microsoft. AAPL is approximately $50 billion below Microsoft's market cap of approximately $259B. The Big Day was Saturday, April 3 when iPad went on sale, including at Best Buy. Reviews of the iPad have been favorable overall. The App Store keeps adding iPad apps and the iBook store the same. I personally was disappointed there wasn't a sell out over the weekend, but 300K+ seemed to be acceptable sales. Estimated 2010 sales of iPad range from 3 million units to 10 million units. It has been suggested that iPad sales might cut into iPhone sales some, but I don't believe this will have a material effect. The OS 4 is to be announced on Thursday, April 8. iPhone continues incredible sales and market share. Apple's share of global mobile Web browsing is at 67% from the iPhone and iPod Touch. The earlier Verizon hype may have been just that, so far. Supposedly, Apple is close to announcing a new personalized, mobile advertising system, iAd. This would compete directly, and replace, Google's advertising platform. The announcement could come tomorrow, Thursday, April 8. Below is the AAPL daily chart from December 2009, including the December 7 close of 188.95 up through the current all-time closing high of 240.60. AAPL: 4 Consecutive Days of All-Time Highs! The uptrend line, a rate of price ascent, is from the January 20, 2009 closing low of 78.20 up through the February 4, 2010 closing low of 192.05. The February 4 closing low was the bottom of the 2010 pullback. AAPL spiked decisively above this uptrend line on February 25. AAPL has now stayed well above. How high can AAPL run until another consolidation and/or pullback? RSIs have increased into overbought territory. How long can this amazing bull run last? The lowest horizontal yellow line is the 10 month exponential moving average from the monthly chart, which I have overlayed on this daily chart. That is the line in the sand, so to speak, for the long term signal of a bear market. AAPL is well above this signal at the current close, the highest yellow horizontal line. Therefore, AAPL is in a long-term bull market and has been since April 2009. AAPL continues onwards and upwards powered by the introduction of the iPad, a new iPhone OS 4, a possible new advertising platform (iAd), and overall strong iPhone sales and market share. The February 4, 2010 YTD closing low of 192.05 was the bottom of the 2010 pullback. The current price is at an all-time closing high. The RSI 14 day and 28 day indicate AAPL is now overbought. The MACD has been bullish since February 16. 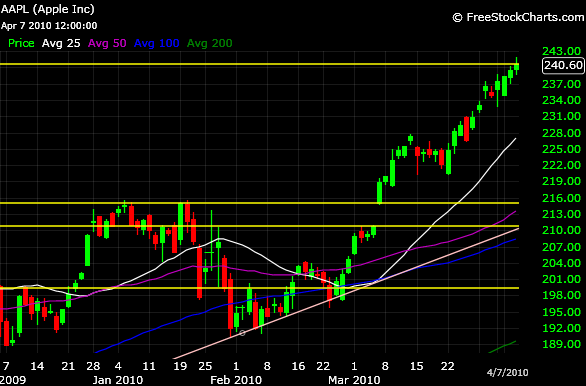 I keep saying additional consolidation and perhaps some pullback is probable before another surge upwards in 2010. It hasn't happened yet, lol. So far the Bulls keep charging ahead - everyone wants in on the Apple Action. The buyers have been in control for days now. The intermediate-term trend became bullish on Friday, March 12. The long-term trend remains bullish.